Resistance & Outrage as Obama Administration Rounds Up Central American Refugees | Democracy Now! managing attorney for CARA Family Detention Pro Bono Project in Dilley, Texas. longtime immigration lawyer with many clients who are detained in the Karnes and Dilley detention centers. The new year began inauspiciously for many immigrant families. Federal agents have detained at least 121 people, including children, in raids as part of an operation to deport families fleeing violence in Central America. 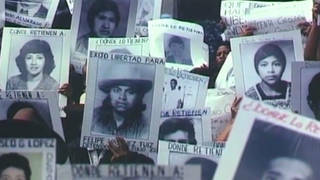 The raids took place mainly in Georgia, North Carolina and Texas. We hear from one of the women targeted by federal authorities. “It was a raid. I think I was one of the first ones detained. On January 2 at 6:45 a.m., they grabbed me. They came to my house looking for someone else,” said Ana, a Honduran immigrant now being detained at the South Texas Family Residential Center in Dilley, Texas, with her 10-year-old son. They arrived in the United States in June 2014 after fleeing Honduras. We hear from Ana and speak to two immigration attorneys, Katie Shepherd and Barbara Hines. AMY GOODMAN: The new year began inauspiciously for many immigrant families. Federal agents have detained at least 121 people, including children, in raids as part of an operation to deport families fleeing violence in Central America. The raids have taken place mainly in Georgia, North Carolina and Texas. On Wednesday, Democracy Now! 's Deena Guzder reached a woman named Ana, who was detained in the raids. She's currently being held in South Texas Family Residential Center in Dilley, Texas, with her 10-year-old son. They arrived in the United States in June 2014 after fleeing Honduras. Speaking by phone, Ana described the New Year’s weekend immigration raid. ANA: [translated] Yes, it was a raid. I think I was one of the first ones detained. On January 2nd at 6:45 a.m., they grabbed me. They came to my house looking for someone else. My aunt opened the door, and they brought us down from the room and then asked me for identification. And they told me I was already deported. DEENA GUZDER: And who came? And how many people? ANA: [translated] In that raid, 33 families were detained, who were the ones deported yesterday. They left yesterday. I don’t know. It was a miracle from God, I don’t know, but only three of us remain who were captured on the 2nd, only three families who were not deported. AMY GOODMAN: Immigrant rights groups say that many of the people targeted in the raids have legitimate claims to asylum but were not afforded due process. Earlier this week, the advocacy group CARA Pro Bono Project won a key victory for four families after a top immigration appeals court halted their deportations. The order came just hours before the 12 people were set to be deported to El Salvador, which now has the highest murder rate in the world for a country not at war. For more, we go directly to Dilley, Texas, where Katie Shepherd is joining us by Democracy Now! video stream, managing attorney for the project and helped win the stays of deportation for the families. We’re also joined in Austin, Texas, by Barbara Hines, longtime immigration lawyer with many clients who are detained in Karnes and Dilley detention centers, formerly with the University of Texas School of Law Immigration Clinic. We welcome you both to Democracy Now! Katie Shepherd, let’s start with you. You’re right there. Describe what’s happened and how you prevented some of the people whose homes were raided, who were going to be deported, from actually being deported. KATIE SHEPHERD: Hi. Good morning, Amy. Basically, we’re meeting with the clients as they trickle in this week. We’re seeing a lot of issues with access to counsel. Many of our clients have been told by ICE that they have no legal recourse, that they have no access to their attorneys, and they’re not allowed to call their attorneys. Now, we represent about 99 percent of the detained women and children in the South Texas Family Residential Center. So, what can I tell you? So far, we’ve submitted nine stays, and 100 percent that we’ve received decisions on have been granted so far. So, I feel that this is a clear indication that something is very wrong here. AMY GOODMAN: Can you explain why this is happening right now? You know, at the top of the show, we ran a quote from The New York Times editorial page today, where they say, “A new year has dawned upon an appalling campaign of home raids by the Department of Homeland Security to find and deport hundreds of would-be refugees back to Guatemala, Honduras and El Salvador. … It’s no wonder that Donald Trump is applauding the policy, and taking credit for it.” If—Barbara Hines, can you talk about why this is happening right now and what you’re doing about this? BARBARA HINES: Well, unfortunately, I think this is happening because of a misapplied immigration policy of our country. And primarily, it’s the failure to recognize what the root causes of migration are—as we just heard, the incredible violence in these countries. What disturbs me the most is that we talk about the Syrian crisis and why people are fleeing, but we treat the mothers and children who are coming as—or they’re referred to as lawbreakers or whatever, when they’re really true refugees. And we need to focus on what’s happening in the countries of origin, which is causing mothers and children to flee at the numbers that we’re seeing today. AMY GOODMAN: What is “temporary protective status”? BARBARA HINES: Well, what I think one of the solutions to this would be, our asylum laws are very, very rigid, and they really haven’t been modernized to the realities of Central America with the tremendous gang and gender-based violence. The way we’ve addressed situations in the past is through temporary protected status, which is in the immigration laws and allows the executive branch and the Department of Homeland Security to decree certain countries and to say it’s too dangerous for those people to return to their home countries. We’ve done this since 1990, and we’ve included countries in Africa, in Syria. We recently declared Nepal because of the earthquake. And I think that we seriously need to begin to think about temporary protected status, in addition to asylum, because many, many of the women do have bona fide refugee claims, as a solution to the situation. AMY GOODMAN: Katie Shepherd, actually, Bernie Sanders is calling for immediate temporary protective status and an end to these raids. The women you’ve represented, who—though their homes were raided, you prevented their deportation. In these last seconds we have together, how did you do this? KATIE SHEPHERD: We filed 11th-hour emergency stays of removal and appeals with the BIA. And at the very last minute, the stays were granted. And actually, yesterday morning, three families were pulled off of planes set for deportation. So that was a big victory. And all of these clients, as I said, have bona fide asylum claims. AMY GOODMAN: You know, the U.S. is a signatory, Barbara Hines, to the [U.N.] Convention Against Torture. These people, many of them, are fleeing horrific violence in their own countries. Is it against the law for the U.S. to deport them? BARBARA HINES: I think the problem with this is, is that many of the women are either unrepresented or they have substandard immigration lawyers. And it’s very difficult for—in an adversarial system that we have, which many countries do not have, to present asylum and Convention Against Torture claims. But, yes, we are a signatory not only to the Convention Against Torture, but to the Convention on the Status and Protection of Refugees. And I think that our government is not complying with those international norms. AMY GOODMAN: Of course, we’ll continue to follow this issue. Barbara Hines, longtime immigration lawyer, and Katie Shepherd, managing attorney for CARA Pro Bono Project in Dilley, Texas, thanks so much for joining us. That does it for our show. Democracy Now! is hiring a director of finance and operations as well as a director of development to lead our fundraising efforts. Visit democracynow.org for more information.